Made with the finest, most gentle natural ingredients, INIKA products have become a saving grace for people who struggle with allergies and sensitivities to other cosmetics. Made in Australia, the range offers outstanding performance, unquestionable quality and a stylish product selection with the most glamorous results. Available in colours and finishes not seen before in natural makeup. Products are easy to wear, kind to skin and remain clear on your conscience. The multi-award winning range includes best-selling mineral foundations and concealers, mineral eye shadows and mascaras, professional brushes and creamy lipsticks. The products are becoming must-haves even for those without sensitive skin as the quality, range and finish easily rival the most high-end, chemical alternatives. Create a highlighted look that is so dewy that it appears as if it’s lit from within. With a creamy formula that blends easily across the high planes of the face, this illuminisor is buildable for a natural glow through to an ethereal highlight. Made with Certifed Organic Coconut Oil (nourishing), Certifed Organic Cocoa Butter (rich in healthy fatty acids), Carnauba Wax (softening) and Candelilla Wax (high in nutrients) and further enriched by Certified Organic Argan Oil (ultra-moisturising) and Vitamin E (anti-oxidant). Gold: The perfect illuminator for all skin tones. I must confess, I've never owned or tried a highlighter... I don't wear foundation or anything like that but I was on the hunt for something to make my skin shine. 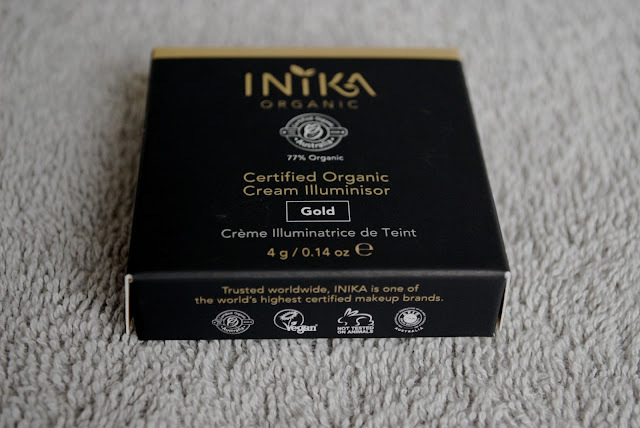 I came across this Inika Certified Organic Cream Illuminisor Highlighter on LoveLula.com. I ended up going with the shade Gold, and I'm so glad that I did as for me, it's perfect. Inika always get me with their packaging, simple yet very classy looking. I find the product itself to be a creamy formula which is easy to apply with my fingers, it also blends into the skin very nicely. I personally love using this highlighter for a little extra something when getting ready for a night out. Now you can buy imported cosmetics online in India from USA at iBhejo where you get a wide range of international brands that are shipped directly to you without any hassle.